An experimental study of the effects of bacterial motility on its transport in a porous medium is presented. For flow velocity that can exceed 10 times the swimming velocity, the transport is found to be strongly retarded by the particle-grain hydrodynamic interaction. This is not observed in nonmotile bacteria. We perform high resolution numerical simulations of a bumblebee interacting with a turbulent inflow for both tethered and free flight. We find that average aerodynamical forces, moments, and power do not vary with turbulent intensity, but their fluctuations grow as turbulent intensity increases. Shock interaction with a bed of randomly distributed particles leads to large variation in the drag forces, highlighting the impact of neighboring particles, and indicating a need for point-particle force models that account for this drag variation. Surface waves in the presence of floating particles are shown to arrest in finite-time as a consequence of dissipation associated with flow between the particles; implications for wave damping by sea ice are discussed. Upper bounds on quantities of interest in Rayleigh-Bénard convection are derived by including a constraint derived from the time evolution equation for advective heat transport. This additional constraint leads to improved bounds on the toroidal dissipation. Direct numerical simulations of passive scalar transport in turbulent channel flow subject to spanwise rotation are performed with two different scalar boundary conditions. A key finding is that rotation strongly reduces the turbulent Prandtl number, irrespective of the scalar boundary conditions. High resolution numerical simulations of the evolution and subsequent degeneration of large amplitude internal standing waves are presented. Emphasized are examples of large amplitude wave train formation coexisting with shear instability. Laboratory experiments demonstrate the generation of internal waves by a short-duration impulsive plume. After the plume descends to a maximum depth, it rebounds to an equilibrium level where the ensuing oscillation results in the generation of a propagating internal wave field. A novel method for reduced-order modeling of turbulent flows is discussed in the context of fully turbulent Rayleigh-Bénard convection. 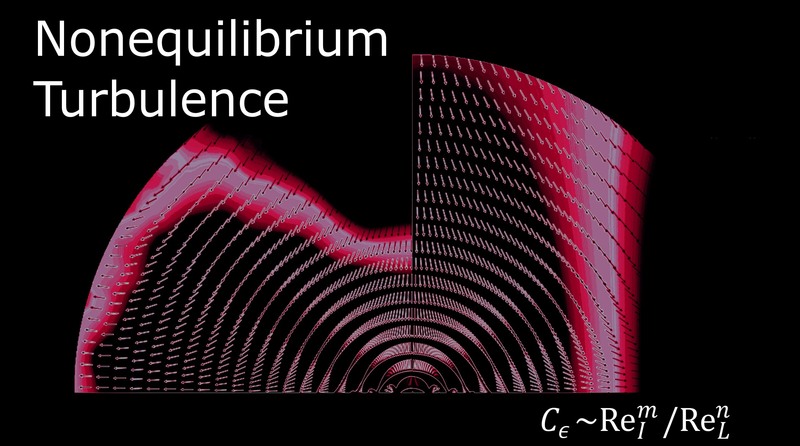 The method can be used to control the turbulent mean profiles, to discern the spectral properties of turbulent flows, and to improve the data-driven techniques. A falling jet of a concentrated suspension is found to break abruptly where its diameter becomes a few particles thick. A simple model explains the jet breakup length observed experimentally. The onset of leading-edge stall on stationary, smooth, thin, two-dimensional airfoils with blunter than classical nose shapes at low to moderately high Reynolds number flows is studied. Global stall is delayed to higher angles of attack as nose bluntness is increased. The influence of various inlet swirling flow profiles on the manifold of steady axisymmetric states of flows, their domain of attraction, and on flow dynamics in a straight, long circular pipe is investigated. Experiments show that Leidenfrost droplets made of water and surfactant undergo a violent explosion. This unexpected behavior is triggered by the formation of a shell during the evaporation. Shortly afterwards, the temperature increases above the boiling point, leading to bubble growth, shell stretching, and explosion. This work expands the scope of modern computational tools for predictive modeling of microscopic active systems, and provides insight into the intricate role of hydrodynamic interaction on the onset of collective behavior of living and synthetic active matter. A recent claim that a liquid drop sliding on a solid has a transition from static to sliding friction, based on an ingenious but indirect experiment, disagrees with molecular dynamics simulations which directly measure the forces involved. To understand the coupling between mixing and vibrational relaxation, a novel state-specific model is solved inside a direct numerical simulation of a compressible jet. It is found that gas compressibility effects trigger vibrational nonequilibrium, while turbulence affects the states’ population.